There’s something magical about nature in the wild. Horses, majestic as they are, are not particularly exotic animals. We routinely see them on farms and in stables. 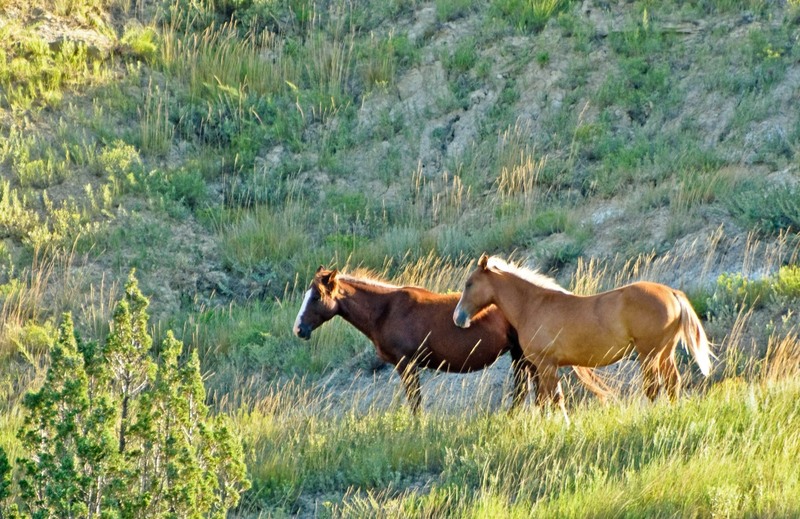 But catching sight of a pair of mustangs, unbridled and unbroken – standing free on a wind-swept mountain – is an entirely different experience. Where is this?I want to see them in the wild so bad.That’s awesome!! That photo was taken in Theodore Roosevelt National Park in North Dakota. It’s a great National Park, and one that doesn’t seem to get as much traffic as many of the others. We practically had the place to ourselves. It was awesome! I really love the Teddy Roosevelt NP and the Black Hills area in general. Just such a beautiful place, that is more quiet than a lot of other NP areas. Thanks for sharing your time there! And have fun in New Mexico! You’re absolutely right about Teddy being quieter than other national parks. We practically had the place to ourselves. It’s a bit out of the way, which is probably why it is less visited, but it is worth the trip.